Local theatre troupe The Smokehouse Players have a new show coming up next month. 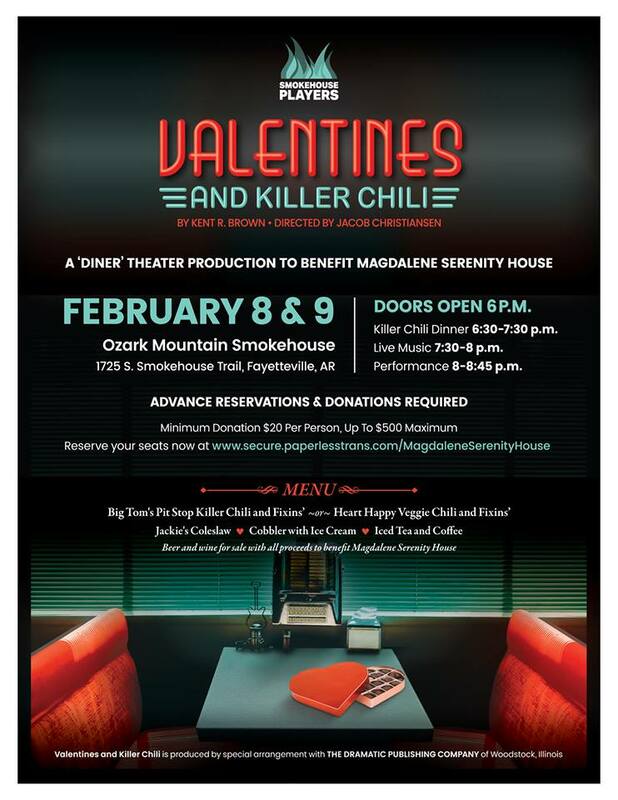 The company will perform a one-act play titled Valentines and Killer Chili by playwright Kent Brown, with two performances scheduled the weekend of Feb. 8-9 at the Ozark Mountain Smokehouse. Here’s the synopsis of the new show. Directed by Jacob Christiansen, this bare-bones production is filled to the brim with humor and a twist of tears as Jason, a chicken hauler, shares his tender memories of Jackie, a waitress with a beehive hairdo, eyebrows like two McDonalds arches, and green-tinted fingernails, who jokes and flirts with the truckers at Big Tom’s Pit Stop while serving up her famous killer chili, making it easier for them to face the lonely miles ahead. The Smokehouse Players were formed in 2017 to perform inside Ozark Mountain Smokehouse by locals Terry Vaughan and Tim Gilster. In addition to the show, actual “killer” regular and veggie chili will be served at the event, along with coleslaw, cobbler with ice cream, and iced tea and coffee. Beer and wine will also be available for purchase. Tickets are available here. Chili will be served at 6:30 p.m., and the show will start at 8 p.m.